Rinse the chicken (inside and out) with cool water and pat dry with paper towels. In a bowl, combine the lemon, onion, garlic, pepper and thyme with the olive oil. Stir until all ingredients are well coated. Stuff the mixture into the cavity of the chicken. Truss with kitchen twine. Place the chicken in a shallow baking pan, breast side up. Spread the butter over the breast and season with salt and pepper. Roast the chicken in the preheated oven for 1 1/2 – 2 hours (or until the temperature taken in the thickest part of the breast reads 180). Remove and baste with the pan drippings. 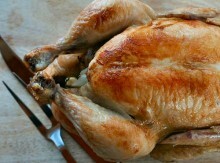 Cover the roasted chicken tightly with foil and let stand for 15 – 20 minutes. Remove the twine, carve and serve immediately. Christmas Day, on vacation, and have to figure out what to make for dinner. Easy! Even in a poorly equipped vacation rental, I was able to make this foolproof chicken recipe and the VERY easy cranberry sauce recipe – delicious! Thanks for helping me out!